US, 1969, 125 minutes, Colour. Kirk Douglas, Faye Dunaway, Deborah Kerr, Richard Boone, Hume Cronyn, Charles Drake. 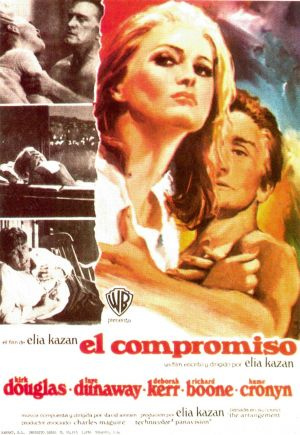 The Arrangement is a film of the 60's in content and technique. The film concerns a middle-aged advertising man succumbing to the pressures of the rat-race, trying to kill himself and suffering a nervous breakdown. Though looking fashionable in colour and Panavision, the film uses a myriad of techniques, for flashbacks and cross-cuts combine past with present and with imagination so that we enter the psyche of the hero and experience the plot from his consciousness. Director Elia Kazan had won two Oscars (Gentleman's Agreement, 1947 and On the Waterfront, 1954) and directed a number of notable films from A Tree Grows in Brooklyn to A Streetcar Named Desire, Viva Zapata, A Face in the Crowd, Splendour in the Grass, Wild River and the autobiographical America, America. He wrote The Arrangement which, the ads tell us, spent 43 weeks on the best-seller list. Kazan shows us some of the problems of contemporary America, the pace of life, the pressures preventing a man from being himself, the disastrous family, marital and extra-marital relationships. Because they are shown from the hero's point of view, we are forced to share the ambiguous worries and think on what Kazan offers. Kirk Douglas has seldom been better than here. Deborah Kerr turns in a good performance as his selfish wife trying to love him. Faye Dunaway looks somewhat familiar as Gwen, but she does this role well. Richard Boone is outstanding as the hero's ageing and paranoid father. This is an adult film, its concerns and treatment are adult and provide thoughtful entertainment. 1. What impression did the opening of the film make – the opulence, the distance of the relationship, formality, luxury, the Zephyr ads and Eddie's following them all, the freeways...? 2. Why did Eddie play with the car? Why did he try to kill himself? 3. Was the film successful in its techniques - flashbacks, quick cross-cuts of imagination, memory, the "Batman" comic sequence, the Zephyr advertisements? 4. Why did Eddie have a nervous breakdown? How did the gradual revelation of his past indicate this - the phoney world of advertising, the zephyr campaign, Gwen's scepticism, his affair, Florence's patience and fidelity, the break-up with Gwen? Why wouldn't he communicate with anyone - was the symbolism of the TV programme on animals of prey too obvious or was it ironic and obvious humour effective? 5. Why couldn't he consummate his marriage with Florence unless he imagined it was Gwen? Was he right to tell Florence all about Gwen? 8. Did he love Gwen? Why did he continually need her? What did she give him? Did she need him or love him? Was it just 'the physical thing'? 7. Why did he go back and ridicule the firm and then fly around the building laughing at them (and his old self there looking at him)? 8. Were you moved by the sequence of Eddie (Evangelos with his father) and his father's love and paranoia? 9. What did you learn about Eddie's childhood - did he love his mother, his father? Why did he came to realise that he hated his father for his money, ambitions and his pushing and that his mother had protected him too much? Yet he showed that he loved his father by trying to protest him from the others? Gwen again? Should she have separated from him? Did she really love him? Did she want the marriage to succeed? 12. Why did Eddie clash with him and tell him that he was ashamed of him? Why did he clash with Gwen when she told him the truth about himself? 13. Why did Eddie burn the old house down and destroy his father's papers? Was he destroying, symbolically, the influence of the old man? 14. Why did he have the scene with Florence and his daughter? did he need to fight with them? 15. Why was he happy to drop out of society and not to talk - did Gwen persuade him that this was cowardice? 16. What was the significance of the funeral scene? Was it the end of most of Eddie's troubles and the beginning of a comeback? 18. Purgatory on earth is a frequent twentieth century device for literature and film to make a man face himself and his past so that he can know himself and face the future. Is it accurate to call The Arrangement an inconclusive purgatorial experience of a self-made failure? Why?